He is silent, yet sounds like rushing wind; he is invisible, but appears as tongues of fire; he is constantly working and giving, but is often overlooked and underappreciated. He is the Holy Spirit, the Lord and giver of Life, the third Person of the Trinity. He has many names in Scripture, including Advocate, Comforter, the Spirit of God, the Spirit of Christ, the Spirit of adoption, the Spirit of grace. In the second chapter of the Acts of Apostle, the coming of the Holy Spirit is described as “a noise like a strong driving wind” and his presence as “tongues as of fire.” Notice how elusive the language is: the Holy Spirit is not a driving wind, but is like such a wind; he is not a tongue of fire, but appears as one. There is a paradox here, which is so often the case with the Holy Spirit: he is both very elusive and yet constantly active. It’s as though you see something or someone out of the corner of your eye, but no matter how quickly you turn, they are gone. Isn’t this the sense conveyed by Jesus, who said to Nicodemus, “The wind blows where it wills, and you hear the sound of it, but you do not know whence it comes or whither it goes; so it is with every one who is born of the Spirit” (Jn. 3:8)? The word “born” is deeply significant for there are three very important births, or creations, described in Scripture in which the Holy Spirit moves and acts, giving life. These three births are closely connected. First, there is the birth of the cosmos and the creation of the world: “The earth was without form and void, and darkness was upon the face of the deep; and the Spirit of God was moving over the face of the waters” (Gen. 1:2). There it is again: the Spirit was moving. 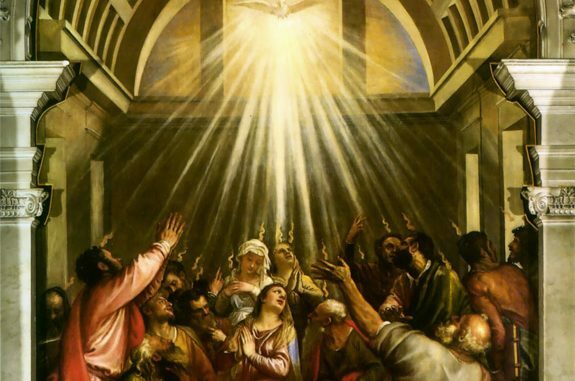 Pope John Paul II, in his encyclical on the Holy Spirit, Dominum et vivificantem (Pentecost, 1986), further notes that the presence of the Spirit in creation not only pertains, of course, to the cosmos, but also to “man, who has been created in the image and likeness of God: ‘Let us make man in our image, after our likeness.’” (par. 12). The second instance is the conception of the God-man, Jesus Christ. What did the angel say to Mary? “The Holy Spirit will come upon you, and the power of the Most High will overshadow you; therefore the child to be born will be called holy, the Son of God” (Lk. 1:35). 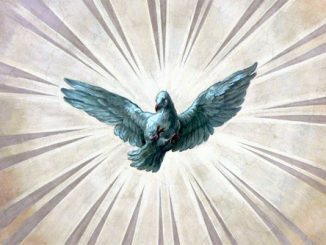 Once again, the Holy Spirit is active; he is coming with power. Once again, he is intimately involved in bringing about a man. In the first creation it was Adam; now, the new Adam. The third birth, or creation, took place at Pentecost, fifty days after the death and resurrection of Christ. “The time of the Church began,” wrote John Paul II, “at the moment when the promises and predictions that so explicitly referred to the Counselor, the Spirit of truth, began to be fulfilled in complete power and clarity upon the Apostles, thus determining the birth of the Church” (DV, 25). At Pentecost, the Church—the family of God and the mystical body of Christ—is birthed by the Holy Spirit. And he is the soul of the Church. “What the soul is to the human body,” wrote St. Augustine, “the Holy Spirit is to the Body of Christ, which is the Church” (Catechism of the Catholic Church, 797). He is still coming, filling, moving, and giving life. Let’s pay attention!